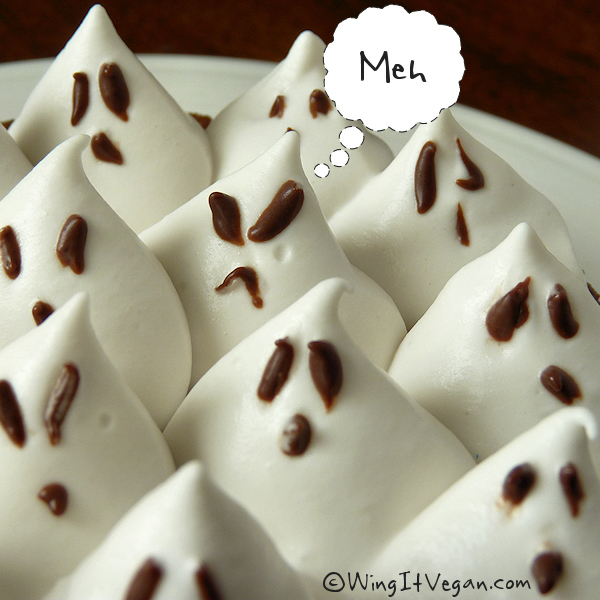 Wing It Vegan: Video: Coconut Milk Whipped Cream Ghosts! 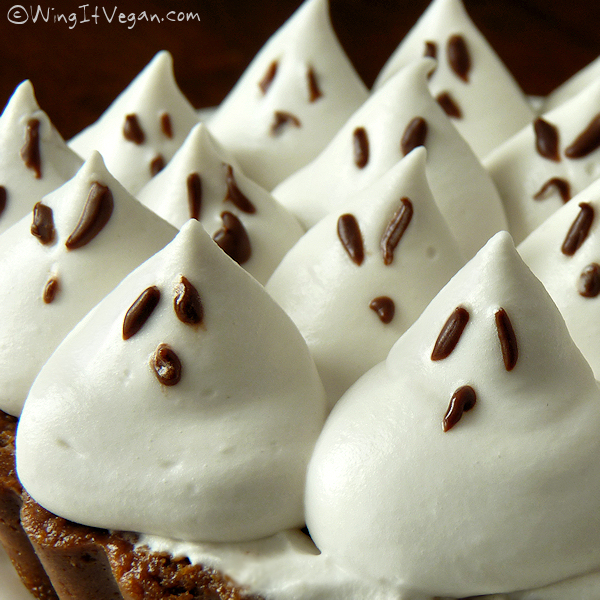 Video: Coconut Milk Whipped Cream Ghosts! 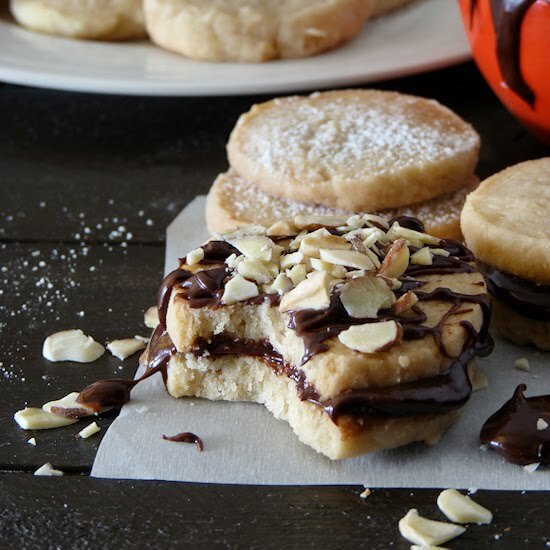 Follow this link for more vegan Halloween recipes! 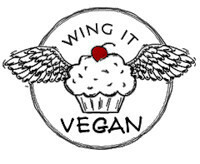 I haven't quit Vegan MoFo! The reason I missed yesterday's post is that I worked on a coconut whipped cream video all day. By the end of the day I had no energy left to blog! A few of you guys said you had trouble turning a can of coconut milk into a whipped cream that would hold its shape, so I set out to solve the coconut cream mystery. I think it comes down to the brand of coconut milk and the type of sweetener that we use. * Full-fat Thai Kitchen Coconut Milk (not "lite") works every time. After a few failed attempts with the non-organic Thai Kitchen coconut milk I assumed that it didn't work as well as the organic one, which never failed me, but as long as they've been properly refrigerated they will both work. * You have to refrigerate the unopened can of coconut milk for at least six hours! Overnight is best, so you can be sure the fat has separated from the liquid. When you are ready to open the can, remember to be gentle and never shake it. * The best choice of sweetener if you really want a stiff whipped cream is powdered sugar. If you want to use a liquid sweetener like maple syrup, keep in mind that more than two tablespoons per can would make your cream too soft. If I am not using it to decorate anything, I prefer a softer, creamier, maple-syrup sweetened cream. If I need it to hold its shape well, I use powdered sugar. You can try Stevia too! * When you're ready to decorate your tart, cake, or whatever you're making - try to keep your hands cool to keep the cream in the pastry/decorating bag/ziploc from melting. Squeeze a bag of frozen peas or wrap your hands around a cold bottle of beer, pickles, ketchup, or whatever you have. The only problem with the little ghosties is that they are very filling! One can of coconut milk makes enough whipped cream to ghostify two mini tarts or one big one, but then you can only eat a little sliver of tart before you're feeling super stuffed. Doing only a small little cluster of ghosts in the center of the tart is a good alternative. Enjoy! Thank you for the super video! Now if only I could magically get my mixer from Madison to Seattle. Awesome tutorial, River! I'm digging the tunes, too. Thanks for all the hard work you put into it! You could be on to something! This was the first time I used my big mixer to make this (I needed something hands-free so I could control the camera.) I always use my hand mixer which is actually WAY more powerful. If your mixer is not as powerful as my fairly weak stand mixer (it's actually a Hamilton Beach, not a Kitchenaid!) then that could be the problem! In case you are interested, my super powerful hand mixer is a 5 Speed Cuisinart Power Select. I don't see that one on Amazon.com anymore, but they do have a 7 speed. Aw, this is such a fun video tute, River! I love the wonky ghost that magically disappears only to be replaced with a better shaped ghostie! Great video. How much powdered sugar would you recommend? Thanks! It depends on how sweet you want it to be. Two tablespoons of sifted powdered sugar is enough for me, but you can always taste it and keep adding more until you're happy with it. The more powdered sugar you add, the stiffer the whipped cream will be! So cute! I mean scary! Nice video. I love the exaggerated hand movements, haha. What a cute video! I never made coconut whipped cream. WHY? ahhh! that was the cutest video ever! I'm making a chocolate pie today. those ghosts are definitely topping my pie. yipee! Thanks so much for making this, River. I super thoroughly enjoyed watching it I need to try straight away. I'm thinking trifle with ghosts on top? I dunno, but I've never made trifle before either and it sounds good!!! Mine was drippy too. However I think it is because my fridge wasn't SUPER cold. I'm going to put it in the freezer next time to totally separate the liquid from the fat. Good idea! I made some Strawberry Santa Hats today using coconut whipped cream and it wasn't quite as firm as it usually is, but I did use a different brand that I was trying out. It's called "Golden Star". It made more cream, but it was pretty soft. Making coconut whipped cream is such tricky business! I would like to make this cream to frost a cake for a birthday; I will definitely have to move the cake to carry to the party, is there a chance that this cream will get runny? I wouldn't risk it because it is a very soft cream. Would it be a big hassle to take the cream in a bowl inside a cooler and frost the cake when you get there? Then you could just bring a whisk to fluff it up and a spatula to cover the cake when you get to the party. If you sweeten it with powdered sugar you will get a firmer cream than if you use maple syrup or another liquid sweetener. Good luck!